The United States Mint is no longer selling 2008-W Uncirculated American Silver Eagles. While standalone eagles sold out over a year ago (on Jan. 23, 2009), collectors could still purchase them from the US Mint through the 2008 Annual Uncirculated Dollar Set. But no longer. The uncirculated set sold out on Thursday after being available for nearly 18 months. They were released on August 7, 2008, for a price of $37.95. The United States Mint sold 2.48 million 2010 American Silver Eagle bullion coins within two days of their Jan. 19 launch, representing more than 8.6% of the total sold as compared to the record-breaking sales in 2009. Why was there such a significant surge? Eagle demand had built up as a result of their delayed release. Newly dated issues are normally available at the very beginning on January. However, the US Mint decided to continue striking 2009-dated eagles late into last year as a result of high demand, and then sell that inventory until depleted. Their supply was exhausted on Jan 12, which meant buyers had to wait almost an entire week for the 2010-dated silver coins. Silver prices averaged over $14.50 an ounce for 2009, but this did not stop investors from buying up a record number of 2009 American Eagle Silver Bullion Coins from the US Mint before they were placed on sell-out status by the Mint on January 12, 2010. According to the latest figures released by the Mint, an astonishing 28,766,500 of the one ounce coins were purchased last year, an increase of 9,183,000 over the amount sold in 2008, which itself was an annual record since the coins were first introduced in 1986. Before this time sales were typically below 10 million a year with only two exceptions, 2002 and 2006, both of which only barely made it above that mark. 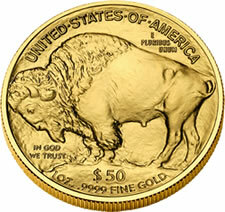 US Mint bullion gold coin sales have been on a run of sorts, following record-setting gold prices -- the yellow metal reached its latest all-time high of $1,153.40 an ounce on Tuesday.